North Male Atoll (also known as North Kaafu atoll) is the most famous atoll and the epicenter of tourism in the Maldives. Home to the capital Malé and the Velana international airport, it is the entry and exit point for almost all tourists visiting the country. The most known and explored diving area in the Maldives, this atoll has the most complete and colorful reefs among all the Maldives. However, this does not mean that there are no other types of dives here. There are also many wrecks, caves, channels, walls and drift diving with large pelagic species such as mantas and hammerhead sharks. With easy accessibility, wide choice of accomodation and a fabulous range of sites, North Malé Atoll is visited by divers more often than any other group of islands in the Maldives. Since the North Male Atoll was a pioneer of tourism in the 1970s, it is the most developed of all the Maldives atolls. The area of 50 islands can offer a lot of resorts and guest houses, although before the trip you should definitely check whether there is a diving center on the local island. North Male Atoll is also a popular place where you can join a liveaboard from Malé Harbor. Velana International Airport (MLE) is well served by flights from Europe and Asia, although the first option may require a stop in the Middle East. If flying from Asia, expect a stopping in Sri Lanka or in India before continuing the flight to Male. To get from Malé to other islands in North Male Atoll, you can take a speedboat transfer or local ferries. Travellers on a budget can find affordable accommodation and cheap dive trips on the islands of Himmafushi, Diffushi and Huraa - a good option for divers who want a break from terrestrial living before or after their dive safari. Recommended resorts with great diving: Summer Island, Thulhagiri island and Makunudu. Local diving centers combine experience, passion and fun surrounded by a fantastic underwater scenery boosting with an amazing marine life, while not compromising on any PADI safety standards. Diving in the North Male Atoll is possible throughout the year, although sea conditions are usually best during the northeast monsoon from late December to May. The southwest monsoon is from June to November and brings with it a greater chance of rain and a less calm seas. However, rainfall here occurs less frequently than in the southern atolls of the Maldives. The water temperature in the South Male Atoll ranges from 26 to 29 ° C.
Diving here can vary greatly throughout the year. 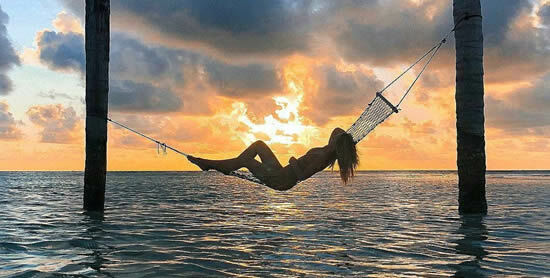 From December to the end of May, during the northeast monsoon, there is dry weather and calm seas. 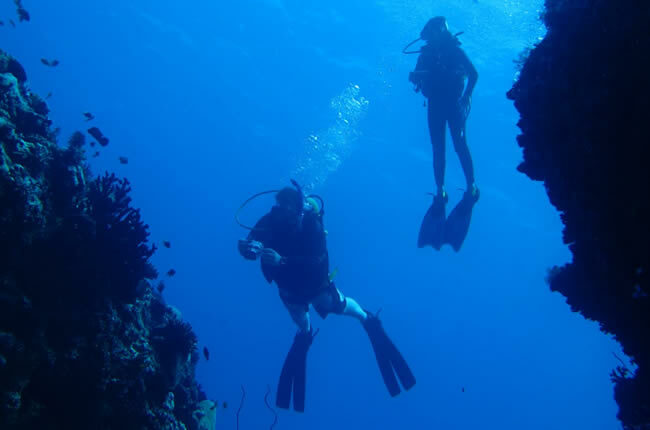 From the end of May to July, the southwest monsoon comes, complicating the conditions for dives. This season, many sea creatures are moving to other spots. The southwest monsoon lasts from August to October, but weakens. There is still a higher likelihood of rain and large waves, but visibility is improving. November is a transitional month that brings strong currents. At this time of year, many dive sites may become more difficult to explore, but big pelagics come in, and divers have a greater chance to spot whale sharks and mantas. During the high season (December to April), dive sites in the North Male Atoll can be crowded with divers and snorkelers, although there are plenty of places for dives and sightseeing. A visit to a lesser-known dive site or resort's house reef will definitely give you a more private dive. In low season (from August to November) discounts on dive packages can be offered as luxury resorts and guest houses. If you are visiting from May to July, make sure that the dive shop on your island continues to work this season. Usually during these months, many dive shops and liveaboards migrate to other atolls. Confirmed liveaboards run from November to May. 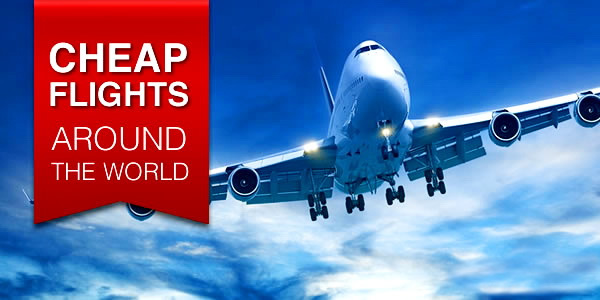 If you wish to arrive outside these months, then it may be more difficult to find a departure date that will satisfy you. North Male Atoll is known for its diversity of species and abundance of marine life. 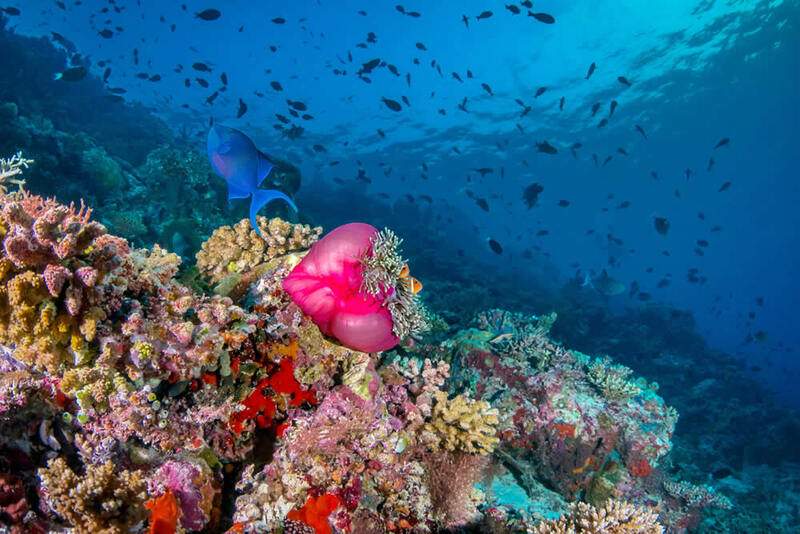 Elsewhere in the Maldives, divers do not see beautiful corals, many of the reefs in this part of the Maldives are healthy and provide refuge for tons of marine life. Here you can find fish frog, moray eels, nudibranchs, schools of fusiliers and hundreds of species of other colorful fish. While the neighboring Ari Atoll is better known for its pelagic species, finding something big is not uncommon in the North Male Atoll. Often there are mantas, whale sharks, hammers, turtles, gray reef sharks and eagles. Diving around the reefs and beyond, you'll find one of the most unspoilt underwater habitats in the world. Wherever you dive into the North Male Atoll, you will surely be amazed at the diversity of the underwater world and the types that you will encounter in just a few dives. The dives sites of North Male Atoll are well dived and among the best known dive sites in the Maldives. 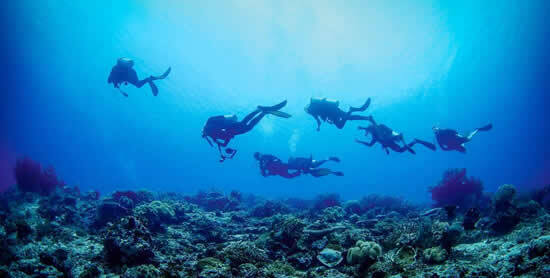 There are more than 50 dive sites in the area. The variety of marine life is amazing. The abundance of fish and corals make for spectacular dives that you will never forget. Expect a beautiful reef scenery and some of the best coral reefs in Maldives. The atoll sees plenty of fish action and you have a good chance of pelagics with mantas and reef sharks frequenting the area at the right times of year. There is also much variety in the dive sites with reefs, caves, current-swept channels and drop-offs to explore; not forgetting an island's own house reef just a few steps from your dive center! Nasimo Thila lies in the South-East of North Male Atoll and is a popular dive site in the Maldives, thanks to the abundance of all forms of marine life and colorful corals. In the Maldives the word ‘thila’ refers to submerged coral towers and caves. This thila offers one of the most spectacular dives in the Maldives. A section of the reef has broken off, leaving huge coral boulders at 18-30m down, covered with a blanket of soft and hard corals. Where the reef has broken off a long series of overhangs and crevices remain for exploration. The ceilings of these overhangs are covered with a beautiful layer of blue soft corals. Nassimo Thila is mainly characterized by turrets, pillars and caves decorated with soft corals of all colors of the rainbow. A collection of large underwater rocks adorn the northeast side of the reef. To the right of the towers, there is a system of caves, permeated with spacious swim through from 15 to 20 meters long. Needless to say, there is a wealth of fish and marine life to be seen at this site. The beauty of this underwater landscape is further enhanced by rare marine species, like Napoleon Wrasse, squirrel fish, fiery orange Basset, scorpion fish, butterfly fish, sea turtles and red groupers. A spectacular dive site, with myriad features, Okebe Thila is another popular dive site that suites both beginners and advanced divers. Located a short distance from Kurumba, this dive site includes three large reefs. The largest cluster of coral is 80m long, looks like a buffalo head, and is separated from two smaller anchorages by a deep canyon 30m wide and 25m deep. Off this reef is a continuous line of ledges and overhangs which are covered with a thick layer of soft corals. On the north end of the reef is an outcrop with abundant fish life, including large groups of bluestripe snapper, oriental sweetlips and fusiliers. On the eastern side is a bigger outcrop where barracudas, Napoleon wrasses, big tuna and trevally can be found. 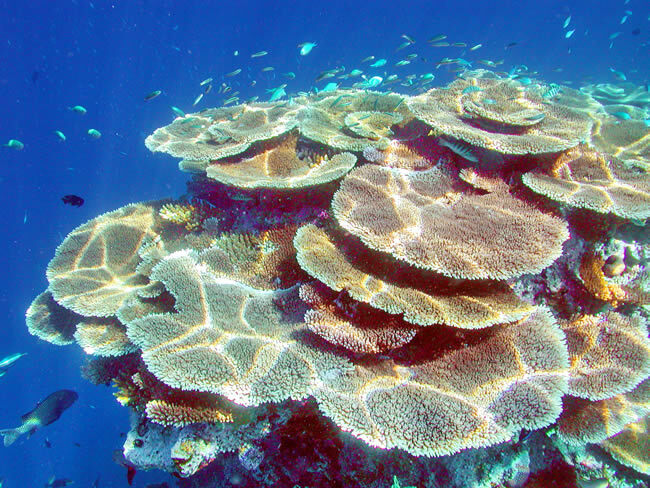 The reef is also known for its excellent coral growth. Even though the reef is not large enough, the abundance of different types of coral and fish will give you the opportunity to see everything at once. Lion's Head is located south of Thila Fushi reef in the channel (about 45 minutes sailing from Male) and is a marine reserve. This reef is a deep wall, with many projections that create perfect conditions for drift diving. The reef top is at about 3 meters and drops down to 45 meters. An overhang shaped like a lion’shead earned this site its name. There is a large cave with lots of soft coral and numerous smallfish. A good macro site for the avid diver. A wide variety of fish, from small basses and fusiliers to large animals, such as sharks, turtles, and more, can be seen on this dive site. Beautiful sea fans and also beautiful hard and soft corals tightly cover the reef. Just keep an eye out for false stone fish and leaf fish. The current will determine the direction of travel but either direction makes for an interesting dive. There is an interesting wall with caverns and holes to explore but don’t forget to look out into the blue for the big tunas cruising by. A legendary site, dubbed by divers ‘fish soup’, Kuda Haa is a thila west of Male’ and north of Giraavaru. This reef is in a protected marine area and teems with colourful fairy basslet. The site comprises two peaks that rise up from the atoll bed and resemble a camel’s back. The larger of the two humps is about 30m in diameter with steep sides. Its peak is just 8m below the surface. The second hump has its shallowest depth at 15m. Both are covered with newly grown hard corals, which offer protection for a diversity of colourful fishes. The thila provides protection to many species of reef fish: snappers, fusiliers, groupers and lion fish. Jack fish and bat fish are also common. On the top of the reef there are many anemones with their resident clown fish. produce a washing machine effect that can make buoyancy control difficult. This site is a protected marine area. For lovers of mantas – this reef is irresistible to manta rays during the southwest monsoon season, with astonishing numbers congregating here. Located south east of Lankan Finolhu (Paradise Resort) it is 1 hours sailing from Male. In the south westmonsoon when the plankton blooms there are many mantas found on this reef, where they feed and get cleaned by the smaller fish at the ‘cleaning stations’. The reef slopes gently down to 40m, dotted with massive Porites corals which house colonies of cleaner wrasse that attract the manta rays. The manta rays come in from the deep water and hover over the coral heads while the wrasses get to work. To make sure you have the best experience, remain neutrally buoyant, stay in one place and let the mantas come to you. The depth is about 15 meters allowing plenty of bottom time. Even without the manta rays, this is still a tremendous dive site with huge schools of fusilier, oriental sweetlips and Napoleon wrasses as well as turtles and moray eels. A unique and exciting dive for novice and experienced divers. The wreck of the MV Maldives Victory lies 10 minutes from Male', south west of the airport. This ship ran aground on Friday the 13th February 1981. It sank the next day and it sits up straight on the bottom parallel to the reef. There is a descent line from the mast to the surface where the dive boats moor. The mast top is at 12 meters and the hull sits on a sandy bottom at 35 meters. When there is not much current this is an excellent introduction to wreck diving. The wreck is easy to dive and you can swim around the deck and explore one of the 3 cargo holds. You can still find lot of the cargo aboard; sacs of cement, paper, bottles, etc. The hull has attracted many fish and a lot of coral and sponges are growing on it. For the more daring divers the wreck is great to go into and explore the different decks, be neutrally buoyant and move slowly and you will have a thrilling experience. Visit the captain's cabin and swim up to the bridge and exit on to the fly bridge. From the top of the bridge you will find a line back to the mast you started from. Be sure you do your safety stop on the way up. Located North of Male on the Line Thulhaagiri Himmafushi, near Aanugandu Faru, 1 hr sailing from Male. It was at this site that the world record dive was successfully conducted on 25th February 2006. It is a long reef running north-south. Between the reef and the thila it is quite shallow with a sandy bottom starting at about 6 meters sloping southwards to 25 meters. If you look around you can spot stone fish and scorpion fish. On the east side the reef drops down to about 30 meters.The reef top starts at 3 meters and is grown with branching and table corals,surrounded by numerous fish. Blue tangs are commonly seen here. At the south part in between the thila and the reef at about 18 meters are some free standing coral blocks where mantas can be seen in season. This dive site is good for beginners because of the sandy bottom where you can complete your diving skills and practice your buoyancy. Located north east of Farukolhu Fushi (previously known as Club Med) on the outside reef, 1 hrs sailing from Male. 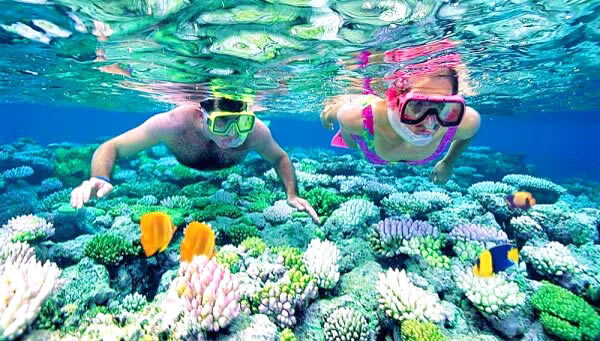 The site is an easy dive and also good for snorkelers. The reef top is very shallow and slopes gradually into the ocean. Large coral blocks are scattered around on the reef and we often find nurse sharks resting beneath. Large tuna and other ocean going fish are commonly seen passing in the blue. Keep the reef on your left shoulder and swim back to the channel entrance. With an incoming current, white tip reef sharks can be seen patrolling here, we have also encountered blue marlin swimming, as well as barracuda and rays. Float in to the channel and explore the overhangs and small caves. About 150 meters into the channel there is an interesting area with big parts broken off the reef with a lot of smaller fish and soft coral.